Photographs mean so much. Seemingly, such a simple piece of paper. But that piece of paper can evoke so much. Why have photographs? Why take portraits? Why hire a wedding photographer? To remember, go back in time, & relive those moments. It's the person or people on that photograph that cause you to want to remember. The happiness that radiates from your wedding day is encapsulated in that photograph. That picture of your baby, with the fine baby hair or newborn skin; which makes you close your eyes and go back to when that baby was so tiny and you just couldn't let go. The family portrait that hangs in your living room and you smile because your children have grown to be such wonderful young adults... Photographs are time machines. You have a time machine in your hand. How do you want to remember those moments? 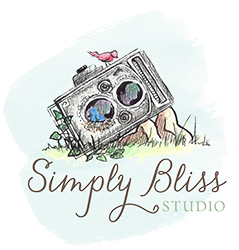 Thank you for considering Simply Bliss Studio for your photography needs. The services that offered, are customized to your needs as both a custom and boutique style experience; because everyone is unique and has different wishes. I invest in my clients and enjoy developing a relationship from first contact to product delivery and beyond. I strive, for you, to have a wonderful experience and are left with a treasure of memories. Ask yourself, how do you want to preserve your memories? If you are looking for beautiful photographs, meticulously and lovingly created... you are in the right place. Please contact or call us at 919-279-8148 for detailed cost information or to create a custom package. I am constantly evolving and adding new session types as well as product items. All transactions require a 7% NC Sales Tax. Portrait sessions start at $85. Clients spend, on average, between $100-$1500 on their session, portrait orders, and wall art orders - from start to finish. Budget friendly options are available. There is no minimum order requirement or hidden fees. Packaged collections, bulk prints, and a'la carte options are offered for ease of ordering prints, products, and digital prints. Portrait sessions offered: Newborn, Grow with Me, Individual, Young Life, Senior, Family, Maternity, Couples, Glamor... Ask us for more. Wedding clients spend, on average between $2300.00-$5500.00. Corporate needs are quoted on an individual basis. Pricing & fees may change with or without notice. All images will remain copyright of Simply Bliss Studio | Lauren Beasley Photography and may be utilized for portfolio and or promotional purposes. Please notify at booking, if for privacy reasons, your session must be private; you will be accommodated accordingly.